Fletcher was born on 13 March 1868 in High Street, Ironbridge, Shropshire, where his father, Benjamin Fletcher (born locally in Coalbrookdale in 1833), was an Iron Moulder at the historic and famous Coalbrookdale Iron Company. Benjamin junior went to work at the Coalbrookdale Company at the age of 11, and in the 1881 census for Ironbridge his employment was recorded as “Errand Boy”. He clearly showed an early talent for art and design, and presumably had lessons at the local Coalbrookdale School of Art, where by the age of 17 he was already a part-time teacher, having greatly impressed the Principal of the School, Augustus Spencer. In 1888 Spencer was appointed Head Master of the Leicester School of Art in 1888 in its purpose-built premises adjacent to the New Walk Museum (now the Lord Mayor’s room wing of the Museum) and he took the twenty-year old Fletcher with him as his deputy. In the 1891 census Fletcher was recorded as an Art Master, living as a boarder just a few yards from the Museum at 38 New Walk. Spencer and Fletcher further enhanced the School and its reputation, and in 1899 School moved to the substantial new Art School built by the Corporation in The Newarke – the first part of what is now the Hawthorne Building of De Montfort University (completed in several further phases between 1909 and 1927). In 1900 Fletcher succeeded Augustus Spencer as Head Master of the Leicester Municipal School of Art and quickly began a programme of innovation and expansion, and not just in the School of Art: in 1901 the School Board adopted a new syllabus for drawing written by Fletcher to be used in all Leicester schools from kindergarten to upper schools. Already aware of the far more advanced approaches to both general art and design and to relating design to industry on the Continent he quickly made a number of study visits, particularly to Germany and Austria, and he also followed up his existing contacts with those involved in the Arts and Crafts Movement including Leicester-born Ernest Gimson and other Cotswold-centred designer-craftsmen associated with Gimson, notable the Barnsley brothers and C. R. Ashbee and his Guild of Handicraft Arts and Crafts community after its move from London to Chipping Campden, Gloucestershire, in 1902. Fletcher persuaded one of the guild silversmiths, John Sidney Reeve, a former art teacher from Bewdley who specialised in chased work, to leave the Guild to join the staff at the Leicester School of Art and establish a department of art metalwork and jewellery, working increasingly with Leicester businesses. On leaving the School one of the first students in this new field, William Pick, formed his own successful company Collins and Co. to produce a wide range of silver, jewellery and metalwork in Arts and Crafts styles such as door fittings and other joinery accessories. In 1902 Fletcher married in Market Harborough Margaret Joan Reynolds (born in Beighton, Derbyshire, in 1877) and the couple set up home at The Red House, 281 Fosse Road South, Leicester, a substantial nine room villa, and in 1903 he joined the Leicester Lit and Phil. His circle of both local and national contacts and influence continued to grow and he continued to innovate and experiment. An important development was his move to expand the School into training for furniture design and production: in 1909 (with evening classes from 1913) this was expanded to include the re-establishment of cane furniture production techniques which had almost completely died out in Britain. This was taken up by his friend and close associate Harry Hardy Peach through his Dryad group of companies and also by other local companies, notably Angrave Cane Furniture Ltd., established in 1912, and Leicester quickly became a major centre for cane and willow furniture and remained so throughout the 20th century. Following Harry Peach’s return from the German Werkbunde’s 1914 Cologne exhibition demonstrating the success of German efforts to link art and design with industrial production, Fletcher joined him and other leading art and design figures in in preparing a Memorandum to both the Board of Trade, the Board of Education and the Director of the Victoria and Albert Museum. This argued that Britain needed to take urgent steps to advance links between design and industry. This was submitted in November 1914 and it was quickly adopted by the Government. One immediate effect was the creation in 1915 of the Design and Industries Association (DIA) – of which Fletcher and Peach were among the founder members and both were to remain very influential within the Association for many years. 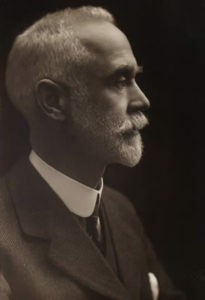 In 1919 Fletcher became President of the Lit and Phil, but the following year he left Leicester on his appointment as Head Master of the Birmingham Municipal School of Art on the retirement of Edward Taylor. However, he retained links with Leicester as an Honorary Member of the Lit and Phil from 1921 to his death 30 years later. In 1922 he was the sculpture of the bronze statuette of Princess Ethelfloeda (d. 918), the eldest daughter of Alfred the Great, who as Queen of Mercia had re-captured Derby and Leicester from the Danes. The work was commissioned by the Corporation out a bequest of £500 left this purpose some years earlier by the Leicester artist and social reformer and women’s suffrage campaigner Edith Gittins (1845 – 1910). In accordance with her wishes Fletcher and a Leicester Art School colleague Crosland McClure designed a substantial public drinking fountain surmounted by Fletcher’s bronze sculpture, which was finally positioned in in Victoria Park (rather than the High Street as Gittins had proposed because of traffic considerations). After the statuette was stolen in 1978, the fountain was relocated to the new Dolphin Square development near the Market Place and the statuette was replaced by a replica. After further acts of vandalism, the statuette and upper part of the fountain were eventually installed in the entrance hall of the City Rooms in Hotel Street, but following the sale of the City Rooms it is now in the courtyard of the Guildhall. In 1934, after his retirement from the Birmingham School of Art Fletcher moved to Sapperton near Cirencester, which had been the centre of the Cotswolds’ Arts and Crafts movement since the days of Ernest Gimson at the beginning of the century, and from 1934 to 1948 he lived in the 14th century and later Daneway House, Sapperton, which had been used for Gimson’s and Sydney Barnsley’s workshops and showroom from 1903. Fletcher died at the age of 83 on 26th September 1951 and was buried (with his wife who had predeceased him) in Sapperton New Churchyard.